Ivory Ribbon Embroidery Chandelier Shade - Delicate hand embroidered flowers dress up this ivory dupioni silk chandelier shade. Multicolored silk ribbons create a beautiful spring garden. We recommend a 25-40 watt bulb for all chandelier shades. 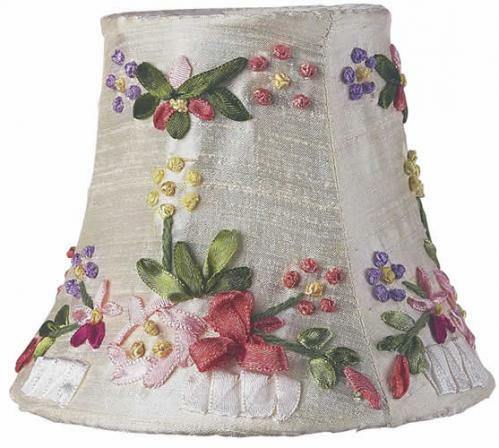 Full Description Ivory Ribbon Embroidery Chandelier Shade - Delicate hand embroidered flowers dress up this ivory dupioni silk chandelier shade. Multicolored silk ribbons create a beautiful spring garden. We recommend a 25-40 watt bulb for all chandelier shades.